Solid State Drives have been replacing Hard Disks on computers lately. Instead of storing data on a rotating magnetic disk, they store data in flash memory: basically silicon chips that keep data even when powered off. They are lighter, use less power, have no moving parts, and most importantly are way faster than hard disks. The problem is that, compared to their rotating counterparts, they are (still) more expensive. Still, prices have dropped dramatically recently. Shlomit’s computer was feeling a little sluggish so I decided to give it a nice little upgrade. 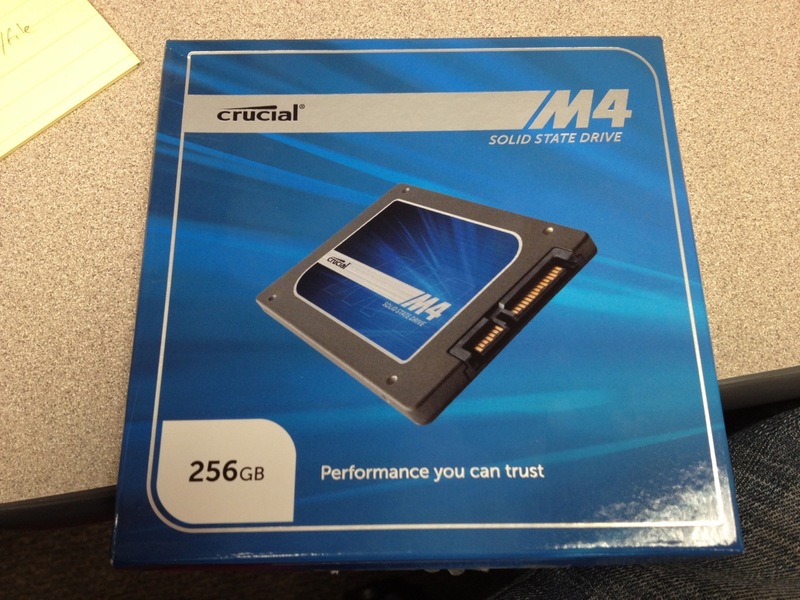 After waiting for a good price on DealMac for a few weeks, I bought a 256 GB Crucial M4 for $180, a very good deal at the time of this writing, to replace the stock 250 GB spinning disk. Copy your Hard Drive contents to the SSD. I used a borrowed adapter to connect the SSD to the Mac via USB. 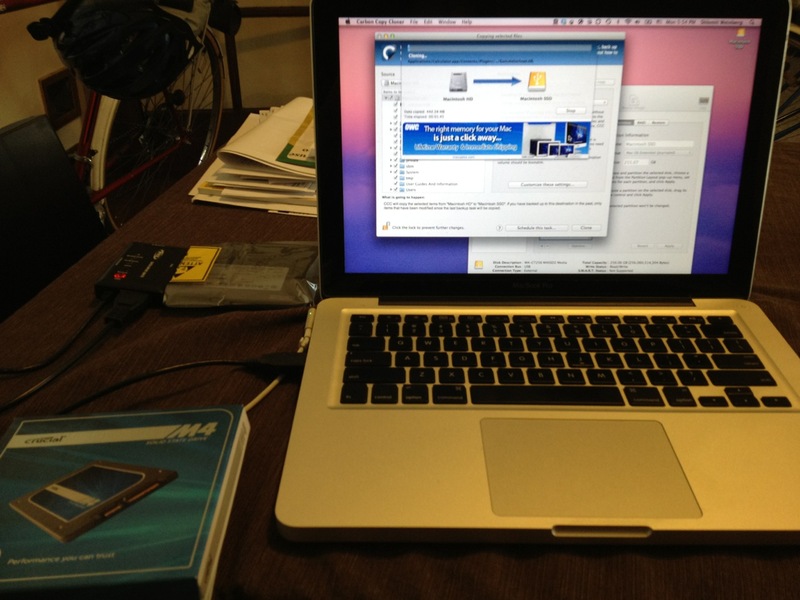 Use Disk Utility (it comes with Mac OS X) to format the SSD. Use Carbon Copy Cloner (donation-ware) to copy the contents of your old hard drive to the new one. This was straightforward and it even created a Recovery Partition on the SSD. But it took a long time: almost 3 hours. Swap the hard drives. It’s easy, just follow the instructions posted on any of hundreds of YouTube videos. Like this one. But make sure you have the right tools, in my case a Philips #0 and a Torx #6 screwdrivers. Turn on your Mac and be amazed at how fast it feels now. Go into System Preferences and make sure you select the SSD as the Startup Disk. Otherwise every time you boot your computer, it’s going to spend ~30 seconds looking for the old drive. Carbon Copy Cloner doing its thing. 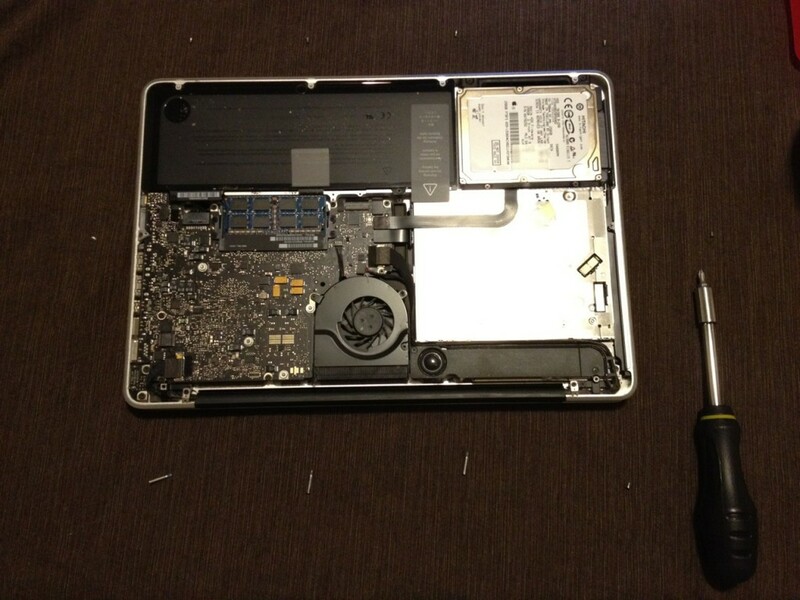 MacBook in mid-transplant. Make sure you don’t misplace a screw. Really, the speed difference is amazing. Everything is snappy. Opening programs like iPhoto or iTunes happens in less than a second. If you have a computer that’s 1-2 years old and you want something much faster without buying a new machine, strongly consider upgrading to an SSD. You may have to sacrifice capacity but I think it’s worth it. Just put your pirate movie collection in an external hard drive and/or pay $25 to keep your music on iTunes Match. Excelente, luego me dices que tal. Reload this page to see more dumb phrase like this one.